Summary: Simply told but deeply affecting, in the bestselling tradition of Alice McDermott and Tom Perrotta, this urgent novel unravels the heartrending yet unsentimental tale of a woman who kidnaps a baby in a superstore—and gets away with it for twenty-one years. 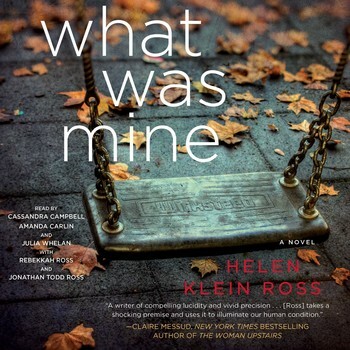 I remember when my good friend Kathy was listening to WHAT WAS MINE by Helen Klein Ross. She really enjoyed it and I was so excited because she was able to share it with me via Audible's new policy! It took me awhile to get around to listening to it, but I'm really glad I did. I have to agree with her that this was a compelling story. 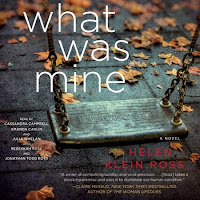 WHAT WAS MINE centers around one woman's desire to be a mother and the extent she would go through to live that dream. Lucy Wakefield and her husband have been trying to have a child for years. It becomes all consuming for Lucy, so much so that she and her husband's marriage fails partly because of it. Lucy throws herself into her advertising career, yet she still longs for a child. One day when Lucy is browsing in IKEA, she sees an infant left alone in a shopping cart. Something overcomes her and she leaves the story with the baby girl. Despite her intentions that she was just taking the baby outside to warm up, she ends up taking the baby home with her. She names the baby Mia and creates an elaborate set of lies... and the two live together and mother/daughter for two decades. Meanwhile, Mia's biological mother Marilyn is devastated to lose her daughter. She and her husband try to keep hope alive, but their marriage eventually falls apart too. Marilyn ends up moving to California after some time and finding a new career, husband, and family. However, she never forgets about her daughter. When Mia eventually discovers the truth about her mother, she is extremely confused. She's also furious with Lucy and decides she never wants to speak with her again. She goes to California and tries to live with her biological mother and new family; however, that proves to be difficult too. Lucy flees to China (where there just happens to be no extradition agreement with the U.S.) and prays that some day Mia will contact her. One of my favorite things about WHAT WAS MINE was the way the author decided to tell the story. The book was written in multiple viewpoints -- mainly Lucy and Marilyn's eyes; however, Mia, the husbands, and even a few minor characters also had their turn. I really appreciated how the author captured each of their voices, and I think the narrators further helped with their interpretations. I also thought WHAT WAS MINE gave me a lot to think about. And that's always a good thing when it comes to a book! While I obviously didn't think what Lucy did was right, I did feel some compassion towards her. (That's also a credit to the author!) I could feel Lucy's desperation and it was a one second decision that forever changed her life... as well as other's lives. While I've never made a decision quite like Lucy's, it does make you think about how your choices alter your future! I also thought the author did a great job in showing the fall-out from Mia's kidnapping. Her portrayal of Lucy's constant paranoia was extremely realistic to me, but she also did a wonderful job in her portrayal of Marilyn and the path she took with her life. And Mia's reaction to learning the truth just resonated with me -- it was perfect. Overall, I found all three characters' reactions to be very believable, and that was refreshing because I did have some issues with believing that Lucy would just steal a baby. WHAT WAS MINE would make an excellent book club pick. There is so much to uncover about these three women, and I do think groups with moms will embrace this novel. There is a reading guide available with twelve questions along with some suggestions to enhance your meeting. Some of the themes you might want to explore include guilt, desire, mother/daughter relationships, marriage, secrets, faith, grief, identity, and forgiveness. I really enjoyed WHAT WAS MINE and highly recommend it to fans of women's fiction. Thanks to Kathy (aka Bermudaonion) for sharing her audio copy of this novel. As you know, I really liked this book too. I was amazed that I felt empathy for Lucy even though she did something I abhorred. I'm glad you enjoyed it too.